“”The president is a Kenyan. The president is a secret Muslim. The president (why not?—after all, every little bit helps) is the unacknowledged love child of Malcolm X.
Obama citizenship denial or birtherism is a rather racist phenomenon that began during the 2008 US Presidential campaign as an attempt to discredit Barack Obama by claiming that he was not born in the United States or that his father was not a US citizen at the time of his birth, and that being born in the US is a requirement for being elected President. [note 1] The bogus suspicion was initially shopped around to media by aides to Clinton's 2008 presidential campaign, then spread by bitter "Democrat" Hillary Clinton supporters who opposed the concession of the nomination to Obama, and taken up by the usual far-right conspiracy theorists. Despite extremely strong evidence that it is outright wrong, and its failure to succeed in any legal challenge, the idea has almost gone mainstream. Most likely this is because it gives an acceptable outlet for racist impulses: it's a few short steps from "he's black" to "he's not one of us" to "he's not really an American." The evidence that Barack Obama is a natural-born U.S. citizen is so overwhelming that disputing this fact constitutes a form of denialism, rather than a mere conspiracy theory. President Donald Trump claimed birtherism as a long-held belief, until suddenly flipflopping in September 2016, personally blaming Hillary for having started the manufactroversy, and claiming that he was now the one to "finally end it". According to the BBC, quote: "there is no evidence to link Mrs Clinton to the birther conspiracy". While that statement is literally true—there is no record of Clinton claiming that Obama is not a natural-born US citizen—McClatchy Washington Bureau Chief James Asher reported being approached with the birther story during the 2008 primaries by Sidney Blumenthal, long time Clinton confidante and senior aide to Clinton's 2008 campaign. 3.1.2 Why not release the long form certificate? 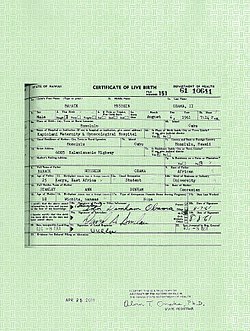 Barack Obama's birth certificate. He was born in Hawaii. Get over it. The reality is that Obama was born in Honolulu, Hawaii, at Kapiolani Hospital, on August 4, 1961 to an immigrant Kenyan father (Barack Obama, Sr.) and American mother (S. Anne Dunham). However, spin propagated on conservative talk radio and other media outlets claim that Obama was not born in Hawaii, or that Obama was a dual citizen at birth (even if born in Hawaii) because his father was a Kenyan citizen at the time of Barack II's birth. The original rumors are attributed to Hillary Clinton supporters, usually southern Democrats, most notably People United Means Action. Motives for such smears continuing despite evidence to the contrary are usually attributed to bitterness that the Republicans lost the election or that they just couldn't stand a black man running the White House. The fact that Obama's father came from Kenya and thus in a way Obama could be considered Kenyan, as he does indeed have relatives there, is the absolute closest thing there is to any truth for this theory. In response to the rumors, the Obama campaign created a website called Fight The Smears which published a scanned copy of Obama's short-form birth certificate. He later allowed factcheck.org to handle and photograph the original artifact. However, for some idiots, that wasn't enough to prove that Obama was born in the U.S. This tempest in a teapot led to the State of Hawaii confirming to the press the weekend before Election Day that it did indeed hold Obama's long-form certificate, a sure and indisputable indication that Obama was born in Hawaii and was thus a natural-born citizen as required by the Constitution. Despite the straight and simple facts, many Americans still insist on following the spin. Common sense dictates that the imagined conspiracy would have to be inconceivably large, requiring a young Obama (or his parents, or some shadowy agency, playing into "Manchurian candidate" conspiracy theories) to plant a birth certificate in Hawaii, fabricate at least two birth announcements in newspapers at the time, falsify college records, bribe immigration officers, and somehow fool election officials. Furthermore, the entire mainstream political establishment, including the Republican Party, would have to be complicit in so far as they have refused to challenge Obama's qualifications. But common sense has never been a large part of the general human thought process. These people were largely ignored until the summer of 2009 when, with a dearth of news stories and 168 hours to fill in a week, cable news channels started to give them serious airtime. People United Means Action are the group of "Hillary supporting democrats" who started the rumors that Barack Hussein Obama wasn't really a naturally born U.S. citizen. The first of these to publicize this rumor (as opposed to spreading it via chain emails and blogs) and file a frivolous lawsuit on the basis of it was Pennsylvania attorney Philip Berg, who is also a 9/11 Truther. This is not a coincidence. Those who maintain the idea that Obama is not qualified to be president, usually in the gnashing teeth of all available evidence, are often called "birthers." There are several prominent birthers whose constant — though loopy — agitation keeps this brain-dead story going. If nothing else, they serve as amusement to the sane. Additionally, questions have been raised about Obama's move to Indonesia as a child and the passport he used to travel to Pakistan as a young man. There's no way a black guy was born here! At the heart of every birther's claim is the need to see Obama's birth certificate. Despite multiple images (officially released scans and the factcheck.org photographs) being available on the internet, birthers claim that Obama still has not produced adequate evidence he was born in Hawaii—an incredible stretch of denial by any standards. As a result of the images of a birth certificate (and thus its entire contents) being available, a new claim developed: that the "short form" birth certificate produced is supposedly available to anybody, even those born out of state or overseas. Nevertheless birthers continually demand that Obama release the original "long form" certificate "with the doctor's signature." This has never been asked of a President before and none have ever had to produce one. The birthers further claim that the Certification of Live Birth (the short-form birth certificate) is not good enough to obtain a range of things, from a passport to entry to pre-schools, depending on who is making the claim. However, the certificate produced states at the bottom that it is "Prima facie evidence of the fact of birth in any court proceeding." The requirements for obtaining a certificate of live birth vary from state to state. A Hawaiian certification would be adequate to obtain a passport. 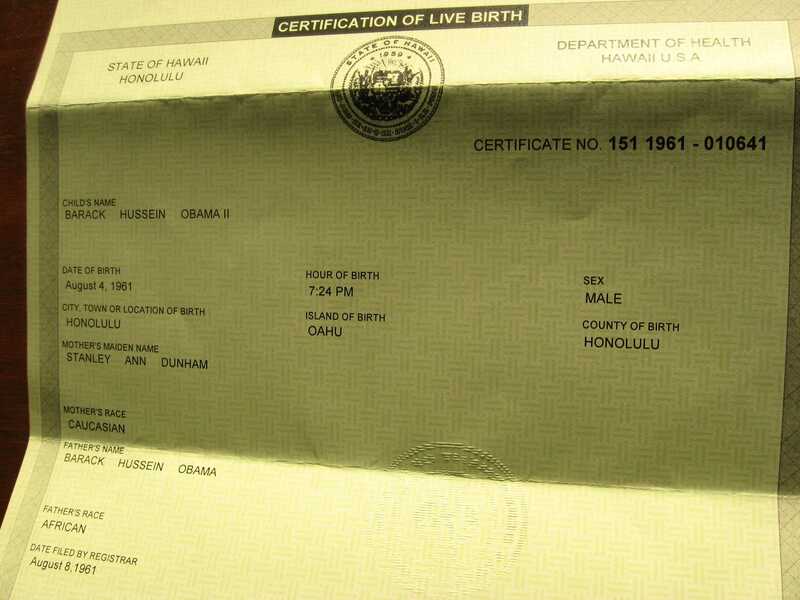 The certificate says he was born in Honolulu – if he was born in another state or another country it would state the actual location of his birth on the certificate, not Honolulu. Birthers also ignore the fact that various people have access to, and have seen, the original certificate rather than just a photograph or image (which should be the same thing, really). “”I, Dr. Chiyome Fukino, director of the Hawai'i State Department of Health, have seen the original vital records maintained on file by the Hawai'i State Department of Health verifying Barrack (sic) Hussein Obama was born in Hawai'i and is a natural-born American citizen. An early claim was that Obama's birth certificate was a Certification of Live Birth not a Certificate of Live Birth, and various claims were made, from it not being of the same legal standing, to it being a forgery. Apparently, not seeing the word they expected to see confused the birthers. Hawaii is considering changing the name to "certificate" to bring it into line with other states. Why not release the long form certificate? The long form certificate, signature and all. In any argument with birthers it is not long before they fall back on "why doesn't Obama just release his long form certificate if he has nothing to hide"? This is the typical conspiracy-based thinking; they assume Obama's birth certificate is being hidden and then they start "just asking questions." The answer is that Obama's short form certificate is sufficient to prove he was born in Hawaii. As they are true kool-aid drinking conspiracy theorists, no amount of evidence is going to convince birthers that Obama is legitimately the President of the United States. If he produces a long form they will claim it is a fake or that a government official is being paid bribes. Once sold on a conspiracy the theorist is unlikely to abandon it, as all evidence to the contrary is just part of the larger conspiracy. Despite the fact that the short-form certificate should have been sufficient, Barack Obama went ahead and released the long-form certificate in April 2011, in both .pdf and coffee-mug formats . Sadly, but predictably, this has not ended the "debate." Apparently, one professional time-waster thought they had found the "jackpot" – Obama's Kenyan birth certificate. WorldNetNutDaily made big news about it plastering it all over the front page. However, many people from reality have pointed out some major flaws in the birth certificate,[note 2] as it's quite unusual for a Kenyan birth certificate to be issued in Australia. It happens that an unknown blogger was responsible for the forged document and "punked" the birthers. Orly Taitz claims that it is up to the courts to determine whether it is real or not. Some people have gone as far as to claim that the Kenyan birth certificate is real and the "torn-up" pictures are fake. Much has been made of the supposed "fact" that Obama's grandmother says he was born in Kenya. Others have claimed that she has made a "sworn deposition" saying that he was born in Kenya. That Obama was born in the USA. Of the lengths to which Obama's detractors will go in order to distort the facts. Obama's birth was announced in the local press in Hawaii as can be seen here. Despite this corroboration of his Hawaiian birth, the birthers are still not convinced. While WorldNetDaily dismiss it as merely indicating that the birth had been registered in Hawaii, as the newspaper receives the announcement from the Department of Health Vital Statistics System, and they claim that it was issued with the certificate of live birth, which they have already decided is unacceptable to them. People on the more nutty end of the scale claim the newspaper clipping is, in fact, a plant. Apparently, Obama's parents wanted to make sure he was a "natural-born citizen" more than 47 years ago, in case he ran for President. Naturally, this argument requires a massive stretch of the imagination to even think that the idea is plausible – these people begin to make the 9/11 Truth Movement look positively sane and respectable at this point, and, of course, just like the moon landing hoax, it would probably have been easier and simpler for Obama's family to take the honest route rather than the conspiracy route. Even Chuck Norris finds this hard to believe. See the Wikipedia article on natural born citizen of the United States. “”All persons born or naturalized in the United States, and subject to the jurisdiction thereof, are citizens of the United States and of the State wherein they reside. Essentially being born in one of the states of the US, as Hawaii had been for two years, makes you eligible to be President once you are 35 and have lived in the country for 14 consecutive years. A few birthers have attempted to cite the mid-18th century treatise Le droit des gens[note 3] by Emerich de Vattel. Vattel claims that an indigène (translated in the 1790s into English using the term "natural-born citizen")[note 4] is someone born to citizen parents within the nation in question. Exactly how this reconciles with the USA's rather straightforward jus soli policy as stated in the 14th amendment is something of a mystery, especially given that if Law of Nations was truly the law of the land, it would be regularly cited in court cases; considering Vattel was a proponent of "natural law" and the founders worked from English common law, this is a pretty big gap. Obama's father was resident in the United States, before Obama's birth. The Naturalization Act of 1790 was superseded by the Naturalization Act of 1795, then the Naturalization Act of 1798 and finally repealed in 1802. The only mention of natural born citizen is in the 1790 act. As a result, this is not current US law and has not been since 1795. The 14th Amendment and the Supreme Court cases mentioned above state that any person born in the United States is a citizen, regardless of where their parents were born and their legal status at the time (unless they are attacking the US or a foreign diplomat). An article of the Constitution, including an amendment, takes priority over any act that may have been in force up to that time. Obama traveled to Pakistan, back in 1981, to visit family. The Birthers insist that travel to Pakistan in 1981 was not possible using a US passport and therefore Obama must have been traveling using another passport – presumably from a country with strong Muslim ties. Of course this is rubbish; there were no restrictions in force at the time. Another attempt at denial of Obama's citizenship attempts to make the claim that Obama is not eligible because Obama's stepfather Lolo Soetoro had enrolled young Obama (as "Barry Soetoro") in the Indonesian school system, listing him as an Indonesian citizen, and because his mother renounced U.S. citizenship by moving to Indonesia in the first place. Aside from there being no proof of Ms. Dunham renouncing her citizenship, the young Obama would not have been affected even if she had. Furthermore, Mr. Soetoro's incorrectly listing his stepson's citizenship as Indonesian on some school forms would obviously have no effect on the latter's actual U.S. citizenship status. In supporting case law, Perkins v. Elg, 307 U.S. 325 (1939) ruled that living outside of the US as a minor, regardless of your parents' citizenship status, did not cause you to lose your birthright citizenship and declared Elg "to be a natural born citizen of the United States. "[note 5] All arguments that center around Obama's step-father, or even a possible adoption, are irrelevant. There is a spreading of the idea that Obama has attended Columbia University as a foreign student in 1981. However, several sources, including Snopes, state the "proof" involves a card layout that did not exist in 1981, and in fact has been manipulated from an I.D. belonging to Thomas Lugert. A scan of Lugert's I.D. card can be found on his own website, with a "Last Modified" date of June 15, 2007 . The card with Obama has several tell-tale signs of forgery, such as bad quality, the fact that the cross on the crown in the background has been slightly mutilated, and the text "Foreign Student" does not align properly with the purple band. Mentioned less frequently is a "controversy" regarding Obama's Social Security Number (SSN), notably that his SSN indicates that it was issued to someone born in Connecticut, not Hawaii — ergo, it must be stolen and Obama must be an alien imposter! Here there is a kernel of truth that has been blown out of proportion. SSN's issued between 1972 and 2011 were indeed linked to geography — specifically, they were linked to the postal ZIP code of the person's mailing address at their time of registration. Obama's does indeed appear to indicate it is linked to Connecticut; however, when Obama registered with Social Security when he was 16 (which was normal until the mid-to-late 1970s, when children started being automatically registered right after birth), he was living in Honolulu, which has a ZIP code of 96814 — one digit off from Danbury, Connecticut's 06814. In all likelihood, it was a simple clerical error. There are also claims that he is using someone else's SSN; these are usually based on erroneous info from public records databases (e.g., someone with sloppy handwriting mis-writes their SSN on a credit card application, and it winds up linking that person with someone else in a database). The court ruling concerning the case (PDF). At least a half dozen lawsuits against the President have been tossed out of court, but on 20 January 2009, Orly Taitz and Gary Kreep, two of the birther lawyers most opposed to Obama filed a lawsuit on Inauguration Day. They issued press announcements saying the judge was brave in the face of political heat to accept the case and now birthers would be able to prove their case. Their purported goal in going to court was to defend a couple of military activists (encouraged by birthers) who refused to ship to the Middle East on the grounds the orders did not come from a legitimate Commander in Chief. As usual, the birthers made many accusations and offered conspiracy theories hypotheses, but provided no evidence. Taitz and Kreep asked for a court order demanding Kenya produce Obama's birth certificate. The judge reasonably pointed out that even if such a document existed, a subpoena from a US judge would be meaningless in a foreign country. The judge noted the soldiers had no problem taking orders from Obama until they were ordered to ship out, when suddenly they developed doubts about the authenticity of his birth in Hawaii. When they got their days in court, birthers mostly uttered political rhetoric and after a few days, the judge ran out of patience, saying they'd presented no evidence, merely accusations. which (a) provided maximum entertainment and embarrassment for the President but also (b) changed the rules because they were now attempting to unseat a sitting President and (c) filed the lawsuit in the wrong venue. The disgusted judge severely criticised their lack of evidence and dismissed the case. In August 2010, the Supreme Court for the second time refused to block fines and sanctions against Taitz. As of January 2014, over two hundred cases regarding Obama's citizenship had been brought to court. In every case, the birthers lost. The birthers made over one hundred appeals, but every appeal was denied. Representative Bill Posey has sponsored a bill, H.R. 1503, to amend the Federal Election Campaign Act of 1971 requiring the campaign committee to give documents proving a candidate for president's eligibility. So far he has found ten co-sponsors for the bill, although those that have given their reasons say it is to put the matter to rest and are sure that Obama will comply with the bill in 2012. In April 2010 the Arizona State House passed a bill requiring everyone running for President of the US in the state to prove their eligibility for the office. The bill has been set aside in the State Senate as it does not have enough votes, even amongst Republicans, to pass. Republican John McCain, Obama's opponent in the 2008 election, was born in 1936 at the Coco Solo Naval Air Station in the Panama Canal Zone. Without question, Panama is definitely a different country than the United States, though the Panama Canal was a United States territory until 1979. His parents were there because his father, a US Navy Admiral, was stationed in what was then a US military base. The fact that nobody objected to his candidacy would indicate that being born on US possessions or military installations overseas is good enough. Also, even if the Canal Zone was not a US territory or military base at the time, McCain's parents, both of whom were US citizens, would have conferred their citizenship to McCain regardless, by jus sanguinis ("right of blood"). George Romney, governor of Michigan and the father of Mitt Romney, ran unsuccessfully for the Republican presidential nomination in 1968. George Romney probably had the most cut-and-dried case against his constitutional eligibility of anyone on this list: he was born in Mexico. His U.S.-born Mormon parents were living there as expats during the period when several Mormon colonies flourished in Mexico. The issue was occasionally raised during his campaign, but since he lost the nomination to Richard Nixon, he never had to face a court challenge to his eligibility. The 1964 Republican candidate, Barry Goldwater, was born in 1909 in Phoenix, Arizona Territory, which was not a state until 1912. Although the Fourteenth Amendment counts those born on US territories as natural-born citizens, there was a minor controversy over Goldwater's birthplace. Republican President Chester A. Arthur spent his one term presidency dogged by rumors that has was born in Canada. Arthur was born 2 October 1829, in a small town 5 miles outside Fairfield, Vermont. His family moved around a lot and often lied about the year he was born. During the 1880 presidential campaign, after Arthur was chosen as James Garfield's running mate, Democrats hired lawyer Arthur Hinman, who set off on a mission to Canada in an attempt to discredit him. Hinman claimed Arthur was born 47 miles further north, in Dunham, Quebec, and had misappropriated the birth records of a brother who was born in Fairfield and died in infancy. The state of Vermont did not keep birth records before 1857 and neither did the town of Fairfield. Add to this the fact that Arthur kept changing the year he was born and it's a better story than the one about Obama. Arthur never publicly commented on the rumors, which was taken by paleo-birthers as a sure sign of his guilt. Hinman cashed in on the rumors with a book, How a British Subject Became President of the United States. Since her announcement of her candidacy for the Democratic nomination for the 2020 presidency, there have been conspiracy theories about Kamala Harris’ illegibility for the presidency. This is based on the premises that both her parents who are Jamaican and Indian university scholars, temporary residents not permanent residents when she born and as such she doesn’t have natural-born-citizen at birth. However, anyone born in the United States is an American citizen, no matter what the parents’ citizenship or residency status. The Usurpation Chronicles – another nutter's blog. Birtherism is Dead. Long Live Birtherism! ↑ Article 2, Section 1, Clause 5 of the United States Constitution states: "No person except a natural born Citizen, or a Citizen of the United States, at the time of the Adoption of this Constitution, shall be eligible to the Office of President; neither shall any Person be eligible to that Office who shall not have attained to the Age of thirty-five Years, and been fourteen Years a Resident within the United States." ↑ Known, somewhat confusingly, as The Law of Nations in English; read it here. ↑ And this is the important bit: after the writing of the US Constitution. The first English translation was in 1760, but the phrase "natural-born citizen" didn't appear till the 1797 translation, and Benjamin Franklin, at least, read it in the original French. Earlier versions left the word "indigènes" untranslated. ↑ The case of Marie Elizabeth Elg is a very interesting when considering what it means to be a US citizen. Elg was born in 1907 to two Swedish nationals who emigrated the US in 1906, only her father had been naturalized by her birth. She was taken back to Sweden in 1911 by her mother and her father returned in 1922. She emigrated to the US in 1929, with a US passport. In 1935 she was threatened with deportation as an illegal alien. The court ruled that she was a natural born citizen, despite her parent repatriating when she was a minor, as she has chosen to be a US citizen herself as an adult. Full text. ↑ Hawaii was admitted as a state on August 21, 1959. ↑ The Department of Health says you can use it for a passport. ↑ Even WorldNutDaily admits it! ↑ Obama Not Qulaified – Claims that "Obama's Kenyan Birth Certificate" are a Hoax and my replies to them. ↑ Obama Not Qulaified – Debunking the discrediter Kenyan birth certificate. ↑ Chuck Norris kicks the birthers gently. ↑ Text of the bill. ↑ Arizona "Birther" Bill Dismissed by White House, Slammed by Critics -CBS News, April 21, 2010. ↑ "Birther" Bill Set Aside By Arizona Senate; Doesn't Have Enough Republican Votes – Phoenix New Times, April 29 2010 . ↑ Obama birthplace flap evokes Arthur debate AP/MSNBC. 2009-08-16.